The Minnesota White Water State Park is located in the southeastern portion of Minnesota, and is one of the most popular parks in the State. It encompasses 2700 acres and is renown for its fishing potential. If you are an angler, you might find yourself in paradise as you experience brook, rainbow, and brown trout that swim in the waters of the Whitewater River and the Trout Run Creek. The Whitewater River is fed by springs and contains some of the freshest and clearest waters in the state of Minnesota. Visitors to the park can also take advantage of a visitor center that is open year round, a sandy beach that is a great spot for swimming, a variety of hiking trails that range from easy to challenging, numerous camping locations, group camps, and up to date group centers. If you visit the camp in the winter, you can enjoy winter activities such as snowshoeing, skiing, and snowboarding. If you want to stay for several days but want to stay warm while you do so, you can visit the group center for lodging that is comfortable yet rustic in cabins that are winterized and hardy. No matter what the time of year is, you can also explore the human and natural history of the state park either by exploring on your own or by visiting one of several visitor center exhibits, interpretive programs, or trails that allow you to guide yourself. 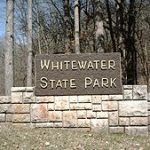 One of the most unique features of the White Water State Park is the range of trails that are available in both summer and winter. For the handicapped, there are 2 miles of trails that can be navigated by wheelchair. The first is the Meadow Trail and the second is the Beach Trail. They both offer excellent views and allow visitors to catch a glimpse of all kinds of wild life, from foxes to beavers to hawks and the occasional eagle. Each of the two trails is a mile long. There are also self-guided options such as the Trout Run Creek trail, which is two miles long in total (one mile out and one mile back in). You get to walk through a wooded valley and can do so without stressing yourself out much. If you want, you can cut into the Meadow Trail, described above, when close to the Whitewater River. There are a surprisingly large number of camping and lodging facilities set up at the Minnesota Whitewater State Park, including pull through sites, drive in sites, electric sites, walk in sites, and handicapped accessible sites. There is an RV length limit of 50 feet that you should be aware of. The drive in sites are particularly popular among residents because there are very few mosquitoes at the camp site in comparison to most camps out there. You can find camping sites in the state park in several different landscape areas, from those that are woody and secluded to those that are open and grassy with views that stretch on for miles. As mentioned earlier, there is a group center present at the state park that is open and available throughout the year. Up to 132 people can find lodging in the 8 cabins present at the site. There are facilities that border upon the luxurious such as bathrooms that are centrally located and include showers, dining halls, and modern kitchens. The cabins, of course, are heated. You can call the park at any time to reserve a cabin for yourself and your friends. Three sanitation buildings are present in the park’s campgrounds that allow residents to shower. However, it is important to note that the showers are only available between the months of April and October. One of the shower buildings (the one located in the Upper Cedar Hills campground) can be accessed by the handicapped. The official website of the Minnesota Whitewater State Park is http://www.dnr.state.mn.us/state_parks/whitewater/index.html . The best time to contact the park is between the hours of 9 am and 4 pm. The contact address is 19041 Highway 74 in Altura, Minnesota, at the zip code 55910. It can be reached at the telephone number 507 932 3007. The park itself is located on State Highway 74, 3 miles south of Elba.